Latin American carriers entered 2012 with mixed fortunes as two of its major players, Brazil’s Gol and TAM, posted losses for 2011 and started the year off reining in their capacity to bolster a yield recovery that started in 2H2011. A USD52 million loss at LAN’s Colombian subsidiary also pressured LAN’s overall profits as the group’s net income fell 24%. Both Copa and Aeromexico turned strong performances last year, and remain confident of continuing their positive momentum in 2012 as the economies of Panama and Mexico continue to grow. But similar to many previous occasions, fuel costs are ushering in a level of uncertainty surrounding Latin America this year. IATA has kept its 2012 profitability forecast of USD100 million for the region intact, which represents a decrease from the estimated USD300 million net profit turned by Latin American carriers in 2011 and a USD900 million profit recorded for 2010. IATA warns that a spike in oil prices late this year could potentially drive Latin America’s overall results into the red for 2012 to USD400 million (see Background information). IATA calculates that fuel prices could average USD115 per barrel in 2012, up from previous estimates of USD99 per barrel. Based on the USD115 per barrel price, IATA is forecasting Latin American carriers to post an average EBIT margin of 1.8% in 2012, down from an estimated 2.4% in 2011 and 5% in 2010. But if the price of oil spikes in 2H2012, resulting in a possible average price of USD135 per barrel for the year, the estimated EBIT margin for Latin American carriers would slip to zero. Panama’s Copa believes the immaturity of the Latin American market allows for the continued successful exploitation of growing demand even as extraordinary events have occurred in the aviation industry on an almost annual basis during the last five years. Copa, in particular, has weathered that period successfully, posting average operating margins of 19.9% from 2007 to 2011, as fuel spiked to UDS147 per barrel in Jul-2008 followed by the global economic downturn and the H1N1 virus breakout in Mexico in 2009. Copa CFO Victor Vial describes the last five years as “anything but normal”. During 2011 Copa posted a 21% operating margin, highest among all publicly listed carriers in Latin America and one of the best results in the world. Five of the six leading airline groups in Latin America were profitable in 2011 with Gol the only exception. Copa CEO Pedro Heilbron emphasises that Panama is the fastest growing country in Latin America with projected GDP growth of 7.2%, driven by expansion of the Panama Canal scheduled for completion in 2014 and an increase in the number multi-national companies selecting Panama as the site for their new regional headquarters from 46 in 2010 to 68 in 2011. But Copa will also benefit from the continued growth in the increasingly important intra-Latin American market, which Mr Heilbron says should average roughly 7% growth for the next 20 years. “That is exactly what Copa is all about,” he says. Intra-Latin America RPKs grew 10% last year and have spiked by 20% through the first two months of 2012, according to data from Latin American airline association ALTA. In comparison, domestic RPKs in Latin America grew by 6% last year and by 5% through the first two months of 2012. Copa is best positioned to exploit the rapid growth in the intra-Latin American market as unlike Latin America’s other major airline groups Copa relies almost entirely on international traffic (only 13% of Copa’s current capacity is allocated to domestic routes, according to Innovata data). Copa is the smallest among the six major Latin American airline groups but is the largest in the intra-Latin America market. Copa’s Panama City hub now offers 56 spokes, including 11 in North America and a market leading 45 throughout Latin America and the Caribbean. This will grow to 49 spokes by July as services to Curacao, Liberia, Recife and Iquitos are launched. The carrier is continuing its recent trend of double digits throughout the last couple of years in 2012 with a planned year-over-year increase in ASKs of 22% by adding a net total of 10 Boeing 737-800s and expanding its average stage-length by roughly 6%. Copa in January unveiled four new destinations – Las Vegas, Recife, Liberia and Curacao – that are scheduled to debut in June. Last week it loaded onto the GDS a new route to Iquitos in Peru, which will be served with two flights per week from 14-Jul-2012. Copa is expected to reveal in the coming weeks another batch of new markets that would roll out in December. The carrier will also stick to its strategy of supporting its comparatively high capacity growth through frequency additions to existing markets, which will account for 20% of Copa’s capacity growth in 2012. Copa continues to exploit Tocumen’s strategic position as a connection point for South America, as 52% of its passengers at the airport are transiting to another destination. The carrier also reiterates bypassing the airport is nearly impossible since roughly 70% of the markets Copa serves from Panama City have fewer than 20 passengers per day each way. Panama City’s key status as a major connection point for intra-Latin American traffic coupled with the potential growth in those markets should leave Copa in a strong position to weather fuel price spikes. 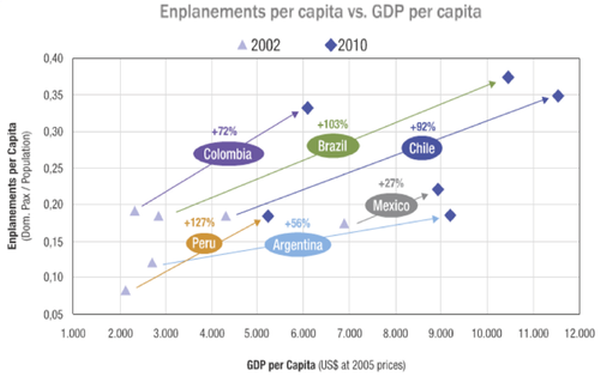 The carrier highlights a doubling of the middle class in Latin America during the last 15 years to more than 180 million, with average enplanement per capital for Argentina, Brazil, Chile, Colombia, Mexico and Peru growing an average of 72.9% from 2002-2010, with Peru showing the largest increase of 127%. Mr Heilbron believes overall enplanements per capita in Latin America remain very low, especially compared with other developed countries including Canada, the US and Australia. The Latin American market has also become less fragmented during the last 20 years, with five large airline groups dominating the region – Aeromexico, Avianca-TACA, Copa, LAN-TAM and Gol. LAN and TAM are now in the final stages of completing their landmark merger, which will make new parent company LATAM by far the largest airline group in Latin America. LATAM will account for about one-third of all seats offered by Latin American carriers. Combined, LAN-TAM, Gol, Avianca-TACA, Aeromexico and Copa now account for roughly three-quarters of all seats offered by Latin American carriers. Given Gol’s predominant focus on the Brazilian domestic market, Mr Heilbron says that leaves just four airline groups competing in the intra-Latin America regional space. “I want to think we [those four carriers] can be very rational with capacity, pricing, etc,” he says. 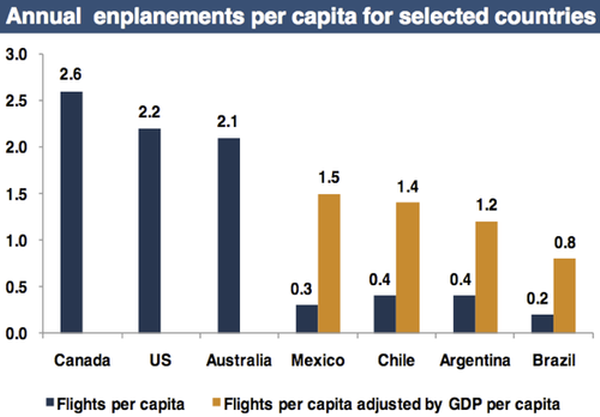 Aeromexico also has a bullish view on the prospects for a solid performance in Latin American aviation in 2012 buoyed by estimated GDP growth of 3.2% for Mexico compared with 1.8% in the US and a contraction of 0.5% in the eurozone area. The carrier in 2011 recorded a 9.8% operating margin, which was the second highest among the five publicly traded airline groups in Latin America. But Aeromexico’s profits fell by MXP253 million (USD19 million) to MXP2.1 billion (USD162 million) in 2011, largely due to accounting adjustments for deferred taxes and non-recurring items. Its revenues increased 28% year-over-year to MXP36 billion (USD2.7 billion). The airline is planning capacity growth of roughly 7% to 11% in 2012 after its supply grew 20% in 2011, which was driven by a 33% capacity increase in international markets. The introduction of 70-seat Embraer E170 aircraft and expansion of the carrier’s 90-seat E190 fleet will account for most of the capacity increase the year. Regional subsidiary Aeromexico Connect is scheduled to introduce three E170s as part of a plan to phase out the smaller 50-seat ERJ145s (two ERJ145s exited the fleet in 1Q2012). Aeromexico’s fleet projections show a net addition of one Boeing 737 narrowbody for a year-end total of 45 and the addition of eight E190s for total 19 at the close of 2012. Aeromexico is also planning an increase in daily departures from its Mexico City hub this year to 500-530 from an average of 442 in 2011. Aeromexico recorded a 23% increase in international passenger traffic in Jan-2012 and a 14% rise for Feb-2012. Its domestic passenger levels grew 1% in January and 10% in February, while overall passenger counts grew 10% in January and 12% in February. Aeromexico along with other Mexican carriers continues to benefit from Mexicana’s exit from the market in Aug-2010 when it sought creditor protection and ceased operations. 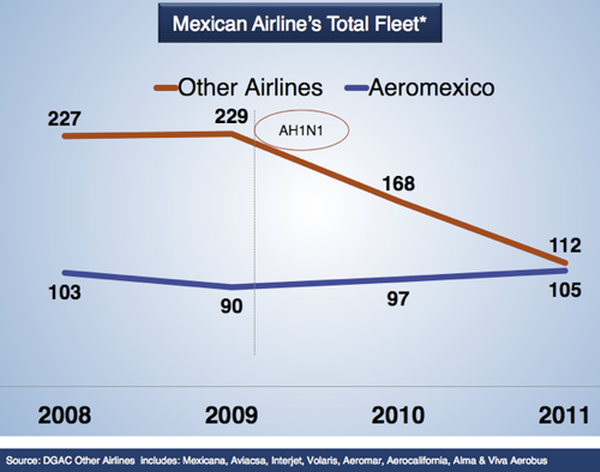 Aeromexico calculates the total number aircraft operated by Mexican carriers has decreased 34% between 2008 and 2011. Earnings at South American airline group LAN tumbled to USD320 million in 2011 from USD420 million the year prior driven by a US52 million loss at its new LAN Colombia subsidiary and disruptions from the eruption of the Pueyhue volcano in Chile, which resulted in numerous flights cancellations over roughly a five-month period from June to October. LAN purchased Colombian carrier Aires in late 2010, and spent 2011 initiating a turnaround plan for the carrier that culminated in the rebranding of the airline to LAN Colombia in Dec-2011. LAN expects a breakeven result for its Colombian operations in 2012. 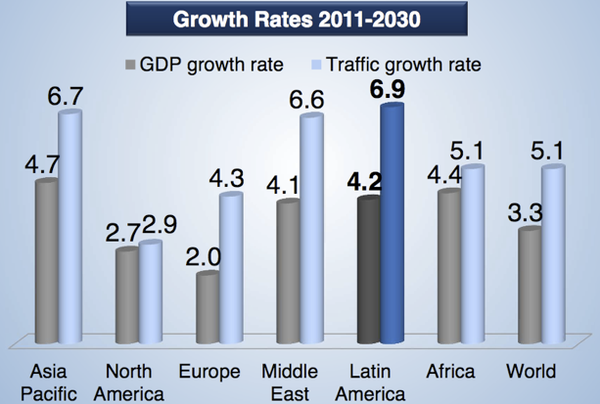 LAN posted 26.4% growth in its passenger revenues in 2011 to USD4 billion and logged a healthy 11.2% rise in yields. Its traffic grew 15.9% on 13.7% rise in capacity, which drove load factors up 1.5 ppts to 79.8%. The company plans to grow capacity this year by 12%-14% as 13 passenger aircraft are added to its fleet. The group will take delivery of its first two Boeing 787s, seven additional 767s and seven additional A320 family aircraft. Three 737-800s from its Colombian operation are being returned as LAN Colombia plans a gradual transition to Airbus A320 aircraft. LAN executives recently stated overall they are seeing positive trends, and the company’s decision to keep capacity steady year-over-year for 2012 reflects its belief of continued growth in Latin America. Avianca-TACA recently reported a net profit of COP202.217 billion (USD113 million) in 2011, representing an increase of 220% over the COP63.049 billion (USD35 million) profit recorded in 2010. Revenues grew by 23% to COP706.5 trillion (USD 3.96 billion). Passenger traffic for the group grew 18% to 20.8 million passengers. This included a 23% increase in domestic traffic to 11.4 million passengers and a 12% increase in international passengers to 9.4 million. The group has domestic operations in Colombia, Peru and Ecuador. The Colombian operation is by far the largest, accounting for 9.8 million passengers. Bogota is also the group’s largest hub, with an average of 1,244 weekly flights operated in 2011 to 45 destinations. The group has three much smaller hubs in San Salvador, Lima and San Jose (Costa Rica). Avianca-TACA grew capacity (ASKs) by 12% in 2011 and plans to grow capacity by a further 8% to 12% in 2012. The group is optimistic that higher fuel prices will not impact profitability as it is forecasting an EBIT profit margin of 6% to 8% in 2012. Avianca-TACA ended 2011 with a 7.4% EBIT profit margin. Colombia-based Avianca and El Salvador-based TACA also plan to complete this year the integration process that began following its early 2010 merger. The group has already completed over 90% of the integration process. Brazil’s two main carriers both recorded losses in 2011, with Gol posting the deepest loss of BRL710 million (USD389 million). TAM’s losses were BRL335million (USD183 million), compared with a profit of BRL634 million in 2011. 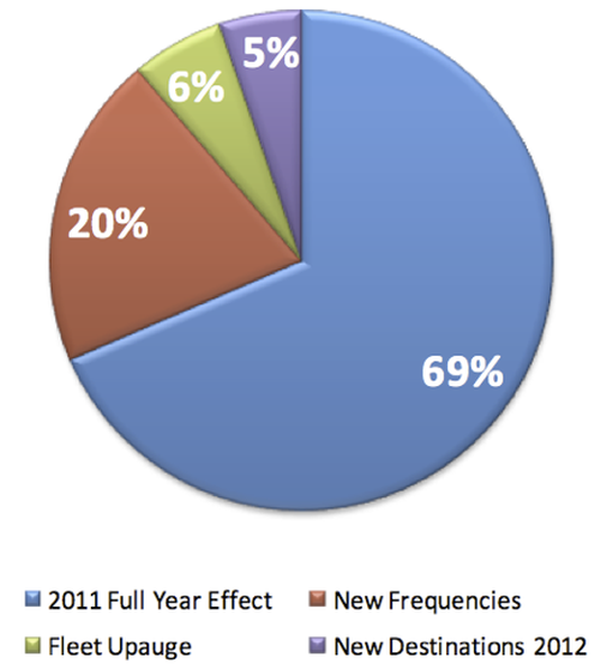 Data from CAPA show GDP growth in Brazil is expected to drop to 3% in 2012 from an increase of 3.8% in 2011. Both Gol and TAM are exhibiting strict capacity restraint to continue a recovery in yields in the domestic market that began late last year as capacity and fares were rationalised. Gol has set a zero-growth scenario for itself while TAM only plans to grow domestic capacity of zero to 2% and international supply by 1% to 3%. TAM’s February results reflected some of the carrier’s capacity constraint as its domestic Brazilian traffic increased 12% on 9% growth in supply. Gol’s domestic traffic fell 2% in February on a 7% rise in capacity, which resulted in the carrier’s decision to cut a combined 80 to 100 daily domestic flights for Gol and its new subsidiary Webjet starting in March. The challenges faced by Brazil’s carriers in rationalising the domestic marketplace underpin IATA’s conclusion that performance is mixed across Latin America as the association warns intense competition in some major markets and slowing economies “will make it more challenging for the region’s airlines to recover the increase in fuel costs they face this year”.